Just open, pinch, sprinkle and enjoy! 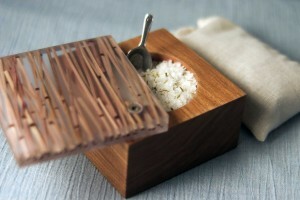 Salts from the Saltistry are exotic, colorful, not fattening and affordable–in other words, the perfect gift! 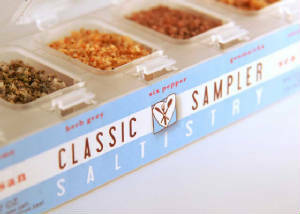 Choose from 5 flavor-infusion gift sets starting from novice flavors such as Herb Grey and Smoked Chili up to the connoisseur set featuring Fennel Pollen or Preserved Lemon salts- $18. For something a little classier you can trade up to a gorgeous handcrafted saltbox made of cherry wood….a modern version of the old salt cellar. $45. This is a great gift idea! And it’s pretty unusual and unexpected, which makes it even better.